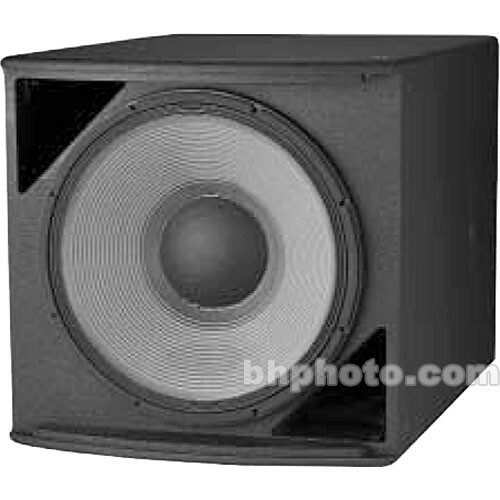 The black JBL ASB-6118 1200-Watt High Power Subwoofer is loaded with an 18" SVG low frequency driver in a front-loaded, vented cabinet configuration. The extended depth of the rectangular cabinet allows for increased low frequency bandwidth while maintaining a minimal frontal profile. The ASB-6118 enclosure is fitted with M10 threaded suspension points, and suits a variety of P.A. applications including theaters, auditoriums, performing arts centers, dance clubs and other array installations. Barrier Terminals accept up to 5.2 mm (10 AWG) wire or maximum width 9 mm spade lugs. Box Dimensions (LxWxH) 36.0 x 25.75 x 23.5"